The moment this status change occurs, you will receive the usual Pre Arrival e-mail from us. 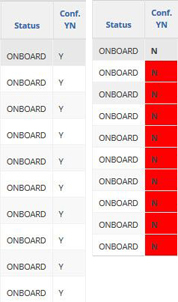 This e-mail lists which orders are confirmed on board the ship. The orders that have not been loaded yet are not listed in this overview. This important distinction between orders that have or have not been boarded can now be found in TCS. The ”OnBoard” status at “Total Overview” has been expanded with the values ‘Confirmed Y/N’. This way, you are completely in the know about which orders are (Y) or are not (N) on board. In addition, the box by the ‘No’ value is red in colour, so that you can immediately spot orders for attention. The new “Confirmed Y/N” functionality provides a clear insight into the status of any order. We are still working on e-mail push notifications for this functionality. This means an automatic e-mail will be sent to you when the “OnBoard No” status does not change to “OnBoard Yes” when the status of other orders does change. You have real-time information at your fingertips and can make arrangements for your deviations (management by exceptions). If required, you can add the “Y/N” column to your “Total Overview” layout. This is a small adjustment, explained in this manual.